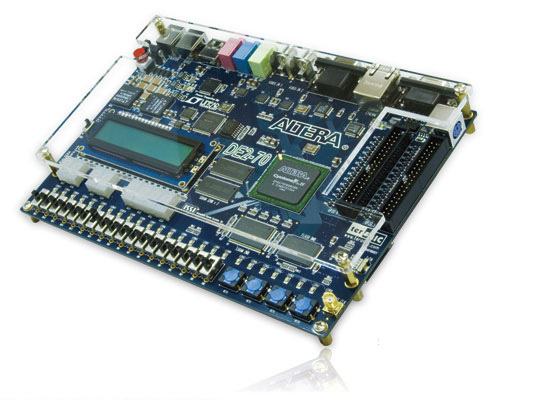 The Altera DE2-70 development and education board, equipped with almost 70,000 LEs of Altera Cyclone® II 2C70, not only adopts the advantages of the Altera DE2 board such as the multimedia, storage, and networking interfaces but also has larger memory components than ever before. The board offers a rich set of features that make it suitable to be used in a laboratory environment for university and college courses, for a variety of design projects, as well as for the development of sophisticated digital systems. Altera provides a suite of supporting materials for the DE2-70 board, including tutorials, "ready-to-teach" laboratory exercises, and illustrative demonstrations.